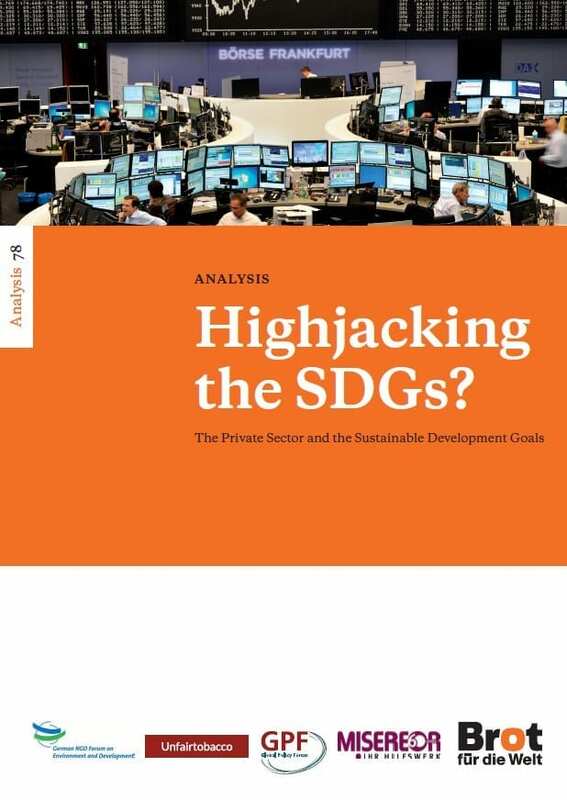 This 32-pages analysis deals with the private sector’s engagement in the implementation of the Sustainable Development Goals (SDGs). The core question is: What is the actual impact of businesses’ SDG activities on global sustainability? The analysis includes a case study on the tobacco industry, written by our policy advisor Laura Graen. She describes how the multinational tobacco corporations Philip Morris International, British American Tobacco, Japan Tobacco International and Imperial Brands are handling the debates on sustainability and their reaction to SDG 3.a which requires the implementation of the WHO Framework Convention on Tobacco Control (FCTC). The chapter contains a clear recommendation for tobacco companies as well as recommendations for other business sectors. "The biggest impact the tobacco industry can have on the achievement of the SDGs is the immediate cessation of all marketing efforts for cigarettes and other harmful tobacco products, and subsequently the stop of manufacture and sale of these products."